Net-zero energy buildings require ongoing collaboration. Here are some tips on how facilities managers and designers can work together after a building is open. The relationship between the project team and the facility manager and operating staff doesn’t end when the keys are handed over. For net-zero energy buildings, the hand-off to the operations team is critical to achieving the required level of energy-efficiency to hit the annual net-zero energy target. With net-zero ready buildings this is just as important as the actual procurement, sizing, and installation of on-site photovoltaics; the addition of renewable energy may still be a while out from initial occupancy, and excess energy use may increase the size (and cost) of the system eventually procured. Rather than a one-time event, the project hand-off is an ongoing process. All buildings go through a teething phase in the first year of occupancy, as HVAC systems face the seasons and occupants learn to control systems and appliances. For net-zero energy buildings, this “verification” phase is critical to determining if the project will annually meet the net-zero equation. Create distinct energy models that represent the building in different states of construction, such as cold shell (unoccupied and unconditioned); unoccupied but conditioned; occupied and fully conditioned. Simulating how the building performs in each of these states, and comparing to metered energy use at each distinct stage of completion, helps teams incrementally understand if the project is on track for net-zero as the date of full occupancy approaches. Augment the traditional commissioning process to include acceptance criteria for equipment during the commissioning trending period. This provides energy analysts with a greater level of detail on performance data of all equipment being commissioned, and aids in comparing design intent to as-built conditions. This is a diagnostics exercise, whereby data on the performance of specific equipment, from energy metering, is compared to its predicted performance in the building energy model. This form of enhanced commissioning (one could call it net-zero energy commissioning) is an early gateway exercise to long-term, real-time measurement and verification of building operations. Appoint a dedicated net-zero energy operations manager who is integrated into facility operations, has the expertise and authority to troubleshoot and track energy use throughout the life of the building, and will educate facility managers. The most successful net-zero energy projects are those where the facility manager is engaged from day one of the design process and collaborates closely with the design-build project team. Many lessons have been learned as the net-zero energy industry has evolved. Amidst unprecedented innovations in the tools and technologies available for gaining a detailed understanding of the living, breathing, working performance of a building during design, construction, and over its lifetime, one thing has remained constant. Whether net-zero verified or net-zero ready, successfully achieving the zero in the equation requires a much-needed spotlight on both procurement and post-occupancy, in a way the traditional design process does not. Rachel Bannon-Godfrey (rachel.bannon-godfrey@stantec.com), Assoc. 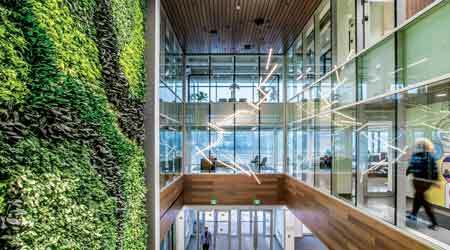 AIA, LEED AP, WELL AP, is principal, discipline leader — sustainability (buildings) for Stantec. Sergio Sádaba (sergio.sadaba@stantec.com), PE, CEng MCIBSE, is principal, mechanical engineering, and Porus Sam Antia (porus.antia@stantec.com), MSc, BEMP, LEED AP, is senior associate, building simulation manager, for the firm. Stantec has been delivering net-zero energy buildings for more than a decade, starting with the National Renewable Energy Laboratory research support facility in 2008 up to the firm’s most recent net-zero energy project for the California Military Department.